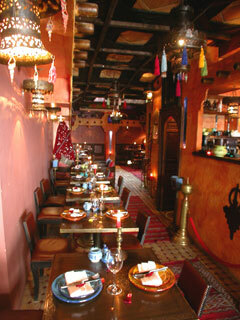 Stepping into CousCous Darna feels like a magic carpet ride into the wonderful and exotic Morocco. The curving architecture, deep colours of the desert, and ancient traditions of hospitality are all incorporated into this restaurant. And food? enough to say that this is the sister restaurant to CousCous Café in Bayswater that have received favourable reviews from many food critics including Time Out. CousCous Darna can only be described as a Moroccan oasis in the heart of South Kensington. Berber pottery, coloured glass lanterns and pierced wooden screens all imported from Morocco create an authentic, cosy ambience. CousCous Darna offers a different and intriguing choice for gatherings of all kinds. There is a private area that seats up to 16 guests or you can hire the whole restaurant seating 65 guests for corporate parties or special events. There are Belly dancers on the weekend. Service is very friendly and the owner is always at hand to give you that extra special attention. Their traditional Moroccan menu lends itself beautifully to feasting, with couscous, tagines, and many starters to share. There�s a good selection of crumbly Moroccan pastries and finish your meal off with a sweet cup of fresh mint tea. The wine list has been specially chosen to complement the food and includes a selection of wines from Morocco. After your meal kickback, relax and smoke a little shisha.